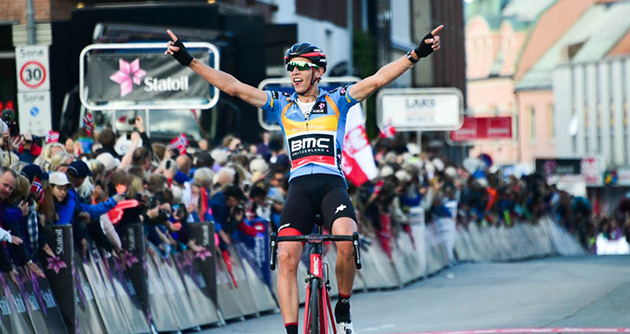 Prime Minister Erna Solberg attended the conclusive stage of the fifth Arctic Race of Norway as well as thousands of fans who welcomed a worthy winner as Dylan Teuns (BMC Racing Team) defended his lead by attacking in the finale to claim the last stage and GC, making it eighth victories in three weeks! In a brilliant manner, the young Belgian put his name after Thor Hushovd, Steven Kruijswijk, Rein Taaramäe and Gianni Moscon on the record books of the northernmost international bike race that continues to amaze the world with the magical landscapes and atmosphere of northern Norway. Following the show of the “Arctic Heroes of Tomorrow” and the victory of u19 Norwegian national champion Idar Andersen from Trondheim ahead of Martin Urienstad and Henrik Schwalb, both from Stavanger like Alexander Kristoff and Sven-Erik Bystrøm, despite a strong chase by Tromsø-native Andreas Leknessund who is the u19 European champion for individual time trial, seven riders formed a breakaway at the exit of Tromsø: Tony Hurel (Direct Energie), Bernhard Eisel (Dimension Data), Kenny Molly (Fortuneo-Oscaro), Dimitri Claeys (Cofidis), Ludvik Aspelund Holstad (Sparebanken Sør), Pavel Brutt (Gazprom-RusVelo) and Jon Soeveras Breivold (Team FixIT.no). Therefore the first intermediate sprint at Larseng, km 21, wasn't part of the fight for the overall win but a walk in the park for Hurel ahead of Brutt and Eisel. 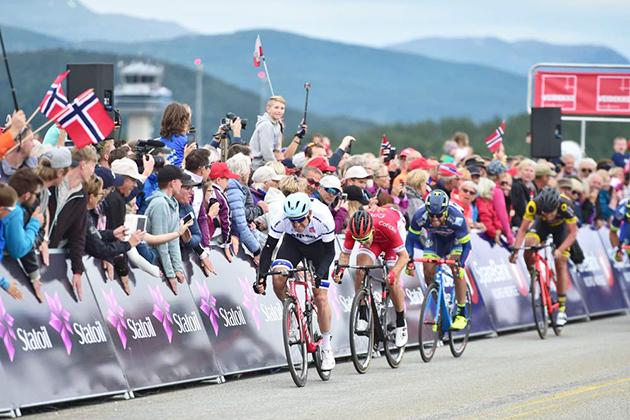 It was the third time in three days for “lakstrøyen” – salmon jersey – Eisel to be part of the breakaway as he eyed the defense of his lead in the King of the Mountains competition in the second half of the stage. The maximum advantage of the seven escapees was 5.45 after 35km of racing before some crosswinds created some excitement at the head of the peloton for a little while. Eisel and Claeys contested the first KOM price at Kattfjordeidet (km 94.5) and rode away from the front group. Sometimes helped by Astana but mostly by Coop, Katusha-Alpecin stabilized the time gap at 3.20 at half way. Eisel secured the salmon jersey in the hills of the finishing circuit and let Claeys go solo in the last 30 kilometres of racing. The Belgian from Cofidis surrendered 22km before the end, firstly rejoined by Sébastien Delfosse (WB-Veranclassic), Leszek Plucinsky (CCC Sprandi), Loïc Chetout (Cofidis), Andreï Grivko (Astana), Bystrøm (Katusha-Alpecin) and Norwegian champion Rasmus Tiller (Joker-Icopal). Bystrøm, Grivko and Chetout forged on with 10km to go. Fabien Grellier (Direct Energie) rejoined them but instead of the highly awaited sprint, a solo attack took place in the last hill with 3km to go. It was race leader Dylan Teuns himself who powered to victory. Runner up August Jensen (Coop) who was just three seconds adrift on GC was forced to react but the Belgian was gone and he rode as brilliantly downhill as uphill. In a thrilling finale, he got enough of a gap to enjoy another victory after stages and GC at the Tour de Wallonie and the Tour de Pologne to make it eight triumphs in three weeks, which is a rare achievement in professional cycling. 3 BYSTRÖM Sven Erik KATUSHA-ALPECIN s.t. 4 GRIVKO Andrey ASTANA s.t. 6 HOEM Börn Tore JOKER ICOPAL s.t. 7 KRISTOFF Alexander KATUSHA-ALPECIN s.t. 8 PACHER Quentin DELKO-MARSEILLE PROVENCE s.t. 9 NAESEN Lawrence WB VERANCLASSIC s.t. 10 WERKILUL Amanuel DIMENSION DATA s.t. 11 HOELGAARD Markus JOKER ICOPAL s.t. 12 SKAARSETH Anders JOKER ICOPAL s.t. 13 LIETAER ELIOT SPORT VLAANDEREN-BALOISE s.t. 14 CORBEL ERWANN FORTUNEO-OSCARO s.t. 15 LOZANO RIBA David NOVO NORDISK s.t. 17 GODON Dorian COFIDIS s.t. 18 JENSEN August TEAM COOP s.t. 20 GRELLIER Fabien DIRECT ENERGIE s.t. 21 BISOLTI Alessandro NIPPO-VINI FANTINI s.t. 22 HAGEN Carl Fredrik JOKER ICOPAL s.t. 23 JEANNESSON Arnold FORTUNEO-OSCARO s.t. 24 SAVITSKIY Ivan GAZPROM-RUSVELO s.t. 25 LUNKE Sindre Skjostad TEAM SUNWEB s.t. 26 KACZMAREK Jakub CCC SPRANDI POLKOWICE s.t. 27 BONNAMOUR Franck FORTUNEO-OSCARO s.t. 28 MEGIAS LEAL Javier NOVO NORDISK s.t. 29 DEGENDT Aimé SPORT VLAANDEREN-BALOISE s.t. 31 DUCHESNE Antoine DIRECT ENERGIE s.t. 32 PASQUALON Andrea WANTY-GROUPE GOBERT s.t. 34 GERTS Floris Solco BMC s.t. 35 BIZHIGITOV Zhandos ASTANA s.t. 36 VENTER Jacobus DIMENSION DATA s.t. 40 KORSÆTH Truls ASTANA s.t. 41 DE BACKER Bert TEAM SUNWEB s.t. 42 DAHL Herman SPAREBANKEN SOR s.t. 44 JANS Roy WB VERANCLASSIC s.t. 46 HALVORSEN Kristoffer JOKER ICOPAL s.t. 47 TCATEVITCH Aleksey GAZPROM-RUSVELO s.t. 49 PALUTA Michal CCC SPRANDI POLKOWICE s.t. 50 MASSON Christophe WB VERANCLASSIC s.t. 51 NIYONSHUTI Adrien DIMENSION DATA s.t. 52 DELFOSSE Sebastien WB VERANCLASSIC s.t. 53 WATSON Calvin AQUA BLUE SPORT s.t. 56 RYBALKIN Aleksey GAZPROM-RUSVELO s.t. 57 ANTONINI Simone WANTY-GROUPE GOBERT s.t. 58 ZAKHAROV Artyom ASTANA s.t. 66 TAARAMÄE Rein KATUSHA-ALPECIN s.t. 67 VANGSTAD Andreas SPAREBANKEN SOR s.t. 68 BRESCHEL Matti ASTANA s.t. 69 DLAMINI Nicholas DIMENSION DATA s.t. 70 AALRUST Håkon Lunder TEAM COOP s.t. 71 WAEYTENS ZICO TEAM SUNWEB s.t. 72 COUANON Jonathan DELKO-MARSEILLE PROVENCE s.t. 77 BLÅLID Marius TEAM FIXIT.NO s.t. 78 KIRSCH Alex WB VERANCLASSIC s.t. 82 BRAMMEIER Matthew AQUA BLUE SPORT s.t. 83 LØVIK Åsmund Romstad TEAM FIXIT.NO s.t. 5 LIETAER ELIOT SPORT VLAANDEREN-BALOISE s.t. 6 PACHER Quentin DELKO-MARSEILLE PROVENCE s.t. 8 HAGEN Carl Fredrik JOKER ICOPAL s.t. 13 LUNKE Sindre Skjostad TEAM SUNWEB s.t. 14 KACZMAREK Jakub CCC SPRANDI POLKOWICE s.t. 60 NIYONSHUTI Adrien DIMENSION DATA s.t. 65 DE BACKER Bert TEAM SUNWEB s.t. 69 BIZHIGITOV Zhandos ASTANA s.t. August Jensen just wins stage three. August Jensen (Team Coop), the only rider from northern Norway, claimed the queen stage of the fifth Arctic Race of Norway at the unprecedented uphill finish of Finnvikdalen, a marvelous setting in the middle of lakes and mountains just a throw stone away from the city of Tromsø where the race will come to an end this Sunday. After beating race leader Dylan Teuns of BMC by a very small margin, Jensen is only three seconds adrift in the overall ranking with one stage to go! Kenny De Ketele (Sport Vlaanderen-Baloise), Håkon Aalrust (Coop) and Herman Dahl (Sparebanken Sør) formed the first breakaway of the five, only 5km after the flag off in the spectacular Lyngen Alps. They lasted at the front for 20km but there were too many ambitious riders in the peloton for the trio to stay away. Moreover, Austrian veteran Bernhard Eisel (Dimension Data) was determined to defend his “lakstrøyen” – the salmon jersey worn by the King of the Mountains. After regrouping, Eisel firstly took Truls Korsaeth (Astana), Ole Andre Austevoll (Coop) and Sébastien Delfosse (WB-Veranclassic) with him. They were rejoined by Hugo Hofstetter (Cofidis), Adrien Petit (Direct Energie), Boris Vallée (Fortuneo-Oscaro) and Daniel Diaz (Delko Marseille-Provence KTM). The peloton kept them under pressure with a two-minute gap after 50km of racing. The fight was on between Eisel and Diaz for the climbing competition. Both riders were part of the breakaway on day 1 as well. Diaz was first at the Vassåsen summit (km 81) and Eisel took his revenge at Sæterlihaugen summit (km 105). The leading group got a maximum time gap of four minutes with 80km to go. 50km before the end, as the peloton mostly led by Floris Gerts for BMC was cruising with a deficit of two minutes, Eisel gave up and waited for the pack. A dispute between Hofstetter and Korsaeth on the occasion of the second intermediate sprint with 29km to go led to splits in the seven-man front group and disorganized attacks while the peloton was just one minute behind. Austevoll, Vallée, Hofstetter and Delfosse forged on. A runner up on stage 2, Hofstetter was determined to stay away from the peloton. But the leading quartet eventually surrendered with 5km to go, right at the bottom of the final climb to Finnvikdalen. Andreï Grivko (Astana) put the hammer down with 3km to go and made a gap for himself. Grivko got reeled in with 1.2km to go. Ben O'Connor (Dimension Data) tried his luck but Dylan Teuns (BMC Racing Team) didn't let anyone go. While Alexander Kristoff (Katusha-Alpecin) was courageously holding on at the back of the first group, the race leader wanted to increase his lead throughout the time bonuses as well as getting a seventh victory in three weeks time. But August Jensen (Coop) sprinted on his side and it was a very tight finish. The photo-finish was needed to determine the winner between Jensen and Teuns. Second to the Belgian on stage 1 in Narvik, the Bodø native claimed the first Hors-Category victory of his career and moved up to second overall with a deficit of only three seconds. Whether he manages to win the Arctic Race of Norway or not, he's already the first ever cycling hero of northern Norway. 3 GODON Dorian COFIDIS s.t. 4 KREDER Michel AQUA BLUE SPORT s.t. 8 HOEM Börn Tore JOKER ICOPAL s.t. 10 KACZMAREK Jakub CCC SPRANDI POLKOWICE s.t. 11 WERKILUL Amanuel DIMENSION DATA s.t. 12 DEGENDT Aimé SPORT VLAANDEREN-BALOISE s.t. 14 CLAEYS Dimitri COFIDIS s.t. 15 LUNKE Sindre Skjostad TEAM SUNWEB s.t. 16 KOCH Jonas CCC SPRANDI POLKOWICE s.t. 17 KRISTOFF Alexander ﻿KATUSHA-ALPECIN s.t. 19 O'CONNOR Ben DIMENSION DATA s.t. 20 WAEYTENS ZICO TEAM SUNWEB s.t. 21 GRIVKO Andrey ASTANA s.t. 24 HOELGAARD Markus JOKER ICOPAL s.t. 28 PARDINI Olivier WB VERANCLASSIC s.t. 30 BONNAMOUR Franck FORTUNEO-OSCARO s.t. 31 LOZANO RIBA David NOVO NORDISK s.t. 33 HOLLENSTEIN Reto ﻿KATUSHA-ALPECIN s.t. 34 DELTOMBE Kevin SPORT VLAANDEREN-BALOISE s.t. 37 BISOLTI Alessandro NIPPO-VINI FANTINI s.t. 38 NAESEN Lawrence WB VERANCLASSIC s.t. 39 KANTER Max TEAM SUNWEB s.t. 40 VENTER Jacobus DIMENSION DATA s.t. 50 SKAARSETH Anders JOKER ICOPAL s.t. 51 TRUSOV Nikolay GAZPROM-RUSVELO s.t. 55 SALOMEIN Jarl SPORT VLAANDEREN-BALOISE s.t. 56 MANNINEN Matti TEAM FIXIT.NO s.t. 58 PONZI Simone CCC SPRANDI POLKOWICE s.t. 59 ANTONINI Simone WANTY - GROUPE GOBERT s.t. 60 ROHDE Leon TEAM SUNWEB s.t. 61 CHETOUT LOÏC COFIDIS s.t. 62 BLÅLID Marius TEAM FIXIT.NO s.t. 65 NIYONSHUTI Adrien DIMENSION DATA s.t. 66 JANS Roy WB VERANCLASSIC s.t. 67 GERTS Floris Solco BMC s.t. 68 DELFOSSE Sebastien WB VERANCLASSIC s.t. 69 DAHL Herman SPAREBANKEN SOR s.t. 70 BRUTT Pavel GAZPROM-RUSVELO s.t. 71 ØVERLAND Bjørnar Vevatne TEAM FIXIT.NO s.t. 72 BRULAND Eirik SPAREBANKEN SOR s.t. 73 DE KETELE Kenny SPORT VLAANDEREN-BALOISE s.t. 75 BRESCHEL Matti ASTANA s.t. 76 MEGIAS LEAL Javier NOVO NORDISK s.t. 77 PASQUALON Andrea WANTY - GROUPE GOBERT s.t. 84 AUSTEVOLL Ole Andre TEAM COOP s.t. 85 WILLIAMS Christopher NOVO NORDISK s.t. 86 BLIKRA Haavard TEAM COOP s.t. 87 HALVORSEN Kristoffer JOKER ICOPAL s.t. 88 AALRUST Håkon Lunder TEAM COOP s.t. 89 VERSCHOOR Martijn NOVO NORDISK s.t. 90 LAUK Karl Patrick ASTANA s.t. 91 TCATEVITCH Aleksey GAZPROM-RUSVELO s.t. 92 BRAMMEIER Matthew AQUA BLUE SPORT s.t. 93 MIHAYLOV Nikolay CCC SPRANDI POLKOWICE s.t. 94 HOLSTAD Ludvik Aspelund SPAREBANKEN SOR s.t. 95 VALLEE Boris FORTUNEO-OSCARO s.t. 96 KONING Peter AQUA BLUE SPORT s.t. 97 SPIKSETH Elias TEAM FIXIT.NO s.t. 98 IRVINE Martyn AQUA BLUE SPORT s.t. 99 MC LAY DANIEL FORTUNEO-OSCARO s.t. 100 CORBEL ERWANN FORTUNEO-OSCARO s.t. 101 MOLLY Kenny FORTUNEO-OSCARO s.t. 103 CARDIS Romain DIRECT ENERGIE s.t. 106 RESTREPO Jhonatan ﻿KATUSHA-ALPECIN s.t. 107 SMUKULIS Gatis DELKO-MARSEILLE PROVENCE s.t. 108 DIAZ Daniel DELKO-MARSEILLE PROVENCE s.t. 109 GROSU Eduard Michael NIPPO-VINI FANTINI s.t. 110 Welten Bram BMC s.t. 111 TILLER Rasmus Fossum JOKER ICOPAL s.t. 5 KRISTOFF Alexander ﻿KATUSHA-ALPECIN s.t. 12 LUNKE Sindre Skjostad TEAM SUNWEB s.t. 13 KACZMAREK Jakub CCC SPRANDI POLKOWICE s.t. 31 VENTER Jacobus DIMENSION DATA s.t. 35 JEANNESSON Arnold FORTUNEO-OSCARO s.t. 58 ANTONINI Simone WANTY - GROUPE GOBERT s.t. 108 BLIKRA Haavard TEAM COOP s.t. 109 IRVINE Martyn AQUA BLUE SPORT s.t. Alexander Kristoff wins the second stage of the Arctic Race of Norway. Home favorite Alexander Kristoff defended his camp at perfection to land his third win in two weeks after the RideLondon Classic and the European championship in the unconventional finishing venue of the military airport of Bardufoss surrounded by tanks and planes who gave an air show to the crowd. He outsprinted French up and coming rider Hugo Hofstetter of Cofidis and Italy's Andrea Pasqualon who moved up to second place overall. 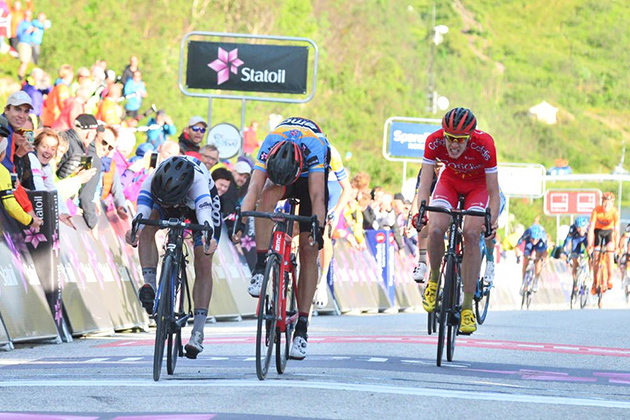 He's only two seconds down on race leader Dylan Teuns who took one second of time bonus in the last intermediate sprint ahead of the queen stage of the fifth Arctic Race of Norway. After 20km of racing, Zhandos Bizhigitov (Astana), Erwan Corbel (Fortuneo-Oscaro), Javier Megias Leal (Novo Nordisk), Elias Spikseth (FixIT.no), Dimitri Claeys (Cofidis) and Nikolay Mihaylov (CCC Sprandi Polkowice) formed the main breakaway of the day. The Dutch duo of BMC Racing Team Floris Gerts and Bram Welten set the pace of the peloton without leaving much room for hope to the escapees. The maximum time gap was 3.20. Corbel claimed the two King of the Mountains sprints of the day, with no chance to take the salmon jersey over from Bernhard Eisel though. Approaching the last hour of racing, the sprinters' teams hadn't taken over from BMC Racing Team at the head of the peloton yet and the time gap went back up to 2.30, which inclined Katusha-Alpecin to ask Reto Hollenstein to up the tempo with 43km to go. The fight for time bonuses started on the military camp of Bardufoss that hosted the last 33km of racing. The breakaway was still ahead with one minute lead when Claeys took the first intermediate sprint with 22.5km to go. Claeys, Corbel and Bizhigitov forged on and Claeys rode solo to win the second intermediate sprint with 14.5km to go as well. Right after the regrouping, Astana set a one-man show for their Norwegian rider Truls Korseath who rode at the front on his own from 13 to 7km to go. Dylan Teuns tried to increase his overall lead in the last intermediate sprint located only 5.5km before the end. He gained one second behind Andrea Pasqualon (Wanty-Groupe Gobert) and Michel Kreder (Aqua Blue Sport). It was all on the runway for a bunch sprint finish. Perfectly led out by his Danish team-mate Michael Morkov, Alexander Kristoff took the stage victory he was aiming for to become the first ever winner with the European champion jersey of professional road cyclist. Teuns retained the overall lead with two seconds over Pasqualon and three over Kristoff. 2 HOFSTETTER Hugo COFIDIS s.t. 3 PASQUALON Andrea WANTY-GROUPE GOBERT s.t. 4 STENUIT Robin WANTY-GROUPE GOBERT s.t. 6 HALVORSEN Kristoffer JOKER ICOPAL s.t. 7 GROSU Eduard Michael NIPPO-VINI FANTINI s.t. 8 SAVITSKIY Ivan GAZPROM-RUSVELO s.t. 9 JANS Roy WB VERANCLASSIC s.t. 10 LIETAER ELIOT SPORT VLAANDEREN-BALOISE s.t. 11 JENSEN August TEAM COOP s.t. 12 PALUTA Michal CCC SPRANDI POLKOWICE s.t. 13 DAHL Herman SPAREBANKEN SOR s.t. 14 VERSCHOOR Martijn NOVO NORDISK s.t. 15 SALOMEIN Jarl SPORT VLAANDEREN-BALOISE s.t. 16 MC LAY DANIEL FORTUNEO-OSCARO s.t. 17 HOEM Börn Tore JOKER ICOPAL s.t. 18 PACHER Quentin DELKO-MARSEILLE PROVENCE s.t. 19 WERKILUL Amanuel DIMENSION DATA s.t. 20 VANGSTAD Andreas SPAREBANKEN SOR s.t. 21 GERTS Floris Solco BMC s.t. 22 CARDIS Romain DIRECT ENERGIE s.t. 23 WAEYTENS ZICO TEAM SUNWEB s.t. 24 GRELLIER Fabien DIRECT ENERGIE s.t. 25 DE NEGRI Pier Paolo NIPPO-VINI FANTINI s.t. 26 TRONDSEN Trond Hakon SPAREBANKEN SOR s.t. 27 DLAMINI Nicholas DIMENSION DATA s.t. 28 EISEL Bernhard DIMENSION DATA s.t. 30 KOCH Jonas CCC SPRANDI POLKOWICE s.t. 31 PONZI Simone CCC SPRANDI POLKOWICE s.t. 32 COUANON Jonathan DELKO-MARSEILLE PROVENCE s.t. 33 KANTER Max TEAM SUNWEB s.t. 35 OFFREDO Yoann WANTY-GROUPE GOBERT s.t. 36 BRESCHEL Matti ASTANA s.t. 38 MASSON Christophe WB VERANCLASSIC s.t. 39 BRULAND Eirik SPAREBANKEN SOR s.t. 40 HAGEN Carl Fredrik JOKER ICOPAL s.t. 41 LUNKE Sindre Skjostad TEAM SUNWEB s.t. 42 BRAMMEIER Matthew AQUA BLUE SPORT s.t. 43 BLÅLID Marius TEAM FIXIT.NO s.t. 44 TEUNS Dylan BMC s.t. 45 TRUSOV Nikolay GAZPROM-RUSVELO s.t. 46 ROHDE Leon TEAM SUNWEB s.t. 47 DE BACKER Bert TEAM SUNWEB s.t. 48 GRIVKO Andrey ASTANA s.t. 49 PARDINI Olivier WB VERANCLASSIC s.t. 50 MORKOV Michael ﻿KATUSHA-ALPECIN s.t. 51 DHAENE BRECHT WANTY-GROUPE GOBERT s.t. 52 TCATEVITCH Aleksey GAZPROM-RUSVELO s.t. 53 SMUKULIS Gatis DELKO-MARSEILLE PROVENCE s.t. 54 DELFOSSE Sebastien WB VERANCLASSIC s.t. 56 BONNAMOUR Franck FORTUNEO-OSCARO s.t. 57 KREDER Michel AQUA BLUE SPORT s.t. 58 DEGENDT Aimé SPORT VLAANDEREN-BALOISE s.t. 60 ZAKHAROV Artyom ASTANA s.t. 62 BISOLTI Alessandro NIPPO-VINI FANTINI s.t. 63 BRUTT Pavel GAZPROM-RUSVELO s.t. 64 MANNINEN Matti TEAM FIXIT.NO s.t. 65 LUKKEDAL Oivind TEAM COOP s.t. 66 NIYONSHUTI Adrien DIMENSION DATA s.t. 68 SKAARSETH Anders JOKER ICOPAL s.t. 69 GODON Dorian COFIDIS s.t. 70 HOELGAARD Markus JOKER ICOPAL s.t. 71 KRAGH ANDERSEN Asbjorn DELKO-MARSEILLE PROVENCE s.t. 72 PLUCINSKI Leszek CCC SPRANDI POLKOWICE s.t. 73 PLANET Charles NOVO NORDISK s.t. 74 VENTER Jacobus DIMENSION DATA s.t. 75 AALRUST Håkon Lunder TEAM COOP s.t. 76 LOZANO RIBA David NOVO NORDISK s.t. 77 ANTONINI Simone WANTY-GROUPE GOBERT s.t. 78 BREIVOLD Jon Soeveras TEAM FIXIT.NO s.t. 79 HENTTALA Joonas NOVO NORDISK s.t. 80 AUSTEVOLL Ole Andre TEAM COOP s.t. 81 MOINARD Amaël BMC s.t. 82 TILLER Rasmus Fossum JOKER ICOPAL s.t. 84 JEANNESSON Arnold FORTUNEO-OSCARO s.t. 85 IRVINE Martyn AQUA BLUE SPORT s.t. 86 DE KETELE Kenny SPORT VLAANDEREN-BALOISE s.t. 87 BLIKRA Haavard TEAM COOP s.t. 88 PORSEV Alexander GAZPROM-RUSVELO s.t. 89 HOLLENSTEIN Reto ﻿KATUSHA-ALPECIN s.t. 90 VALLEE Boris FORTUNEO-OSCARO s.t. 91 ARISTI GARDOKI Mikel DELKO-MARSEILLE PROVENCE s.t. 99 WATSON Calvin AQUA BLUE SPORT s.t. 101 CHETOUT LOÏC COFIDIS s.t. 102 DEVRIENDT Tom WANTY-GROUPE GOBERT s.t. 104 HOLSTAD Ludvik Aspelund SPAREBANKEN SOR s.t. 105 LØVIK Åsmund Romstad TEAM FIXIT.NO s.t. 106 ØVERLAND Bjørnar Vevatne TEAM FIXIT.NO s.t. 107 BOU Joan NIPPO-VINI FANTINI s.t. 113 TAARAMÄE Rein ﻿KATUSHA-ALPECIN s.t. 114 MEGIAS LEAL Javier NOVO NORDISK s.t. 115 MIHAYLOV Nikolay CCC SPRANDI POLKOWICE s.t. 117 KORSÆTH Truls ASTANA s.t. 119 NISHIMURA Hiroki NIPPO-VINI FANTINI s.t. 120 HIVERT Jonathan DIRECT ENERGIE s.t. 122 SPIKSETH Elias TEAM FIXIT.NO s.t. 9 HOEM Börn Tore JOKER ICOPAL s.t. 10 PACHER Quentin DELKO-MARSEILLE PROVENCE s.t. 11 VANGSTAD Andreas SPAREBANKEN SOR s.t. 12 GRELLIER Fabien DIRECT ENERGIE s.t. 13 HAGEN Carl Fredrik JOKER ICOPAL s.t. 14 PARDINI Olivier WB VERANCLASSIC s.t. 17 GRIVKO Andrey ASTANA s.t. 19 WAEYTENS ZICO TEAM SUNWEB s.t. 20 HAGEN Krister TEAM COOP s.t. 21 BRESCHEL Matti ASTANA s.t. 22 LUNKE Sindre Skjostad TEAM SUNWEB s.t. 23 BONNAMOUR Franck FORTUNEO-OSCARO s.t. 24 DELFOSSE Sebastien WB VERANCLASSIC s.t. 26 ARISTI GARDOKI Mikel DELKO-MARSEILLE PROVENCE s.t. 28 KACZMAREK Jakub CCC SPRANDI POLKOWICE s.t. 30 DHAENE BRECHT WANTY-GROUPE GOBERT s.t. 31 SKAARSETH Anders JOKER ICOPAL s.t. 33 DE NEGRI Pier Paolo NIPPO-VINI FANTINI s.t. 35 DEGENDT Aimé SPORT VLAANDEREN-BALOISE s.t. 37 GODON Dorian COFIDIS s.t. 38 PLUCINSKI Leszek CCC SPRANDI POLKOWICE s.t. 39 MOINARD Amaël BMC s.t. 42 O'CONNOR Ben DIMENSION DATA s.t. 43 BRUTT Pavel GAZPROM-RUSVELO s.t. 44 VENTER Jacobus DIMENSION DATA s.t. 45 DUCHESNE Antoine DIRECT ENERGIE s.t. 49 DLAMINI Nicholas DIMENSION DATA s.t. 50 KANTER Max TEAM SUNWEB s.t. 51 ROHDE Leon TEAM SUNWEB s.t. 52 KRAGH ANDERSEN Asbjorn DELKO-MARSEILLE PROVENCE s.t. 53 PLANET Charles NOVO NORDISK s.t. 54 HENTTALA Joonas NOVO NORDISK s.t. 55 TILLER Rasmus Fossum JOKER ICOPAL s.t. 58 OFFREDO Yoann WANTY-GROUPE GOBERT s.t. 60 JEANNESSON Arnold FORTUNEO-OSCARO s.t. 62 SALOMEIN Jarl SPORT VLAANDEREN-BALOISE s.t. 65 RYBALKIN Aleksey GAZPROM-RUSVELO s.t. 69 MANNINEN Matti TEAM FIXIT.NO s.t. 71 BOU Joan NIPPO-VINI FANTINI s.t. 74 AALRUST Håkon Lunder TEAM COOP s.t. 78 LUKKEDAL Oivind TEAM COOP s.t. 80 JANS Roy WB VERANCLASSIC s.t. 81 PETIT Adrien DIRECT ENERGIE s.t. 82 NIYONSHUTI Adrien DIMENSION DATA s.t. 83 AUSTEVOLL Ole Andre TEAM COOP s.t. 84 HOLLENSTEIN Reto ﻿KATUSHA-ALPECIN s.t. 97 SKJOLD Mathias SPAREBANKEN SOR s.t. 106 MIHAYLOV Nikolay CCC SPRANDI POLKOWICE s.t. 107 MEGIAS LEAL Javier NOVO NORDISK s.t. 111 BRULAND Eirik SPAREBANKEN SOR s.t. 112 BREIVOLD Jon Soeveras TEAM FIXIT.NO s.t. 113 IRVINE Martyn AQUA BLUE SPORT s.t. 114 DE KETELE Kenny SPORT VLAANDEREN-BALOISE s.t. 115 BLIKRA Haavard TEAM COOP s.t. 116 PORSEV Alexander GAZPROM-RUSVELO s.t. The race: Here's the story from stage winner Dylan Teuns' BMC team. 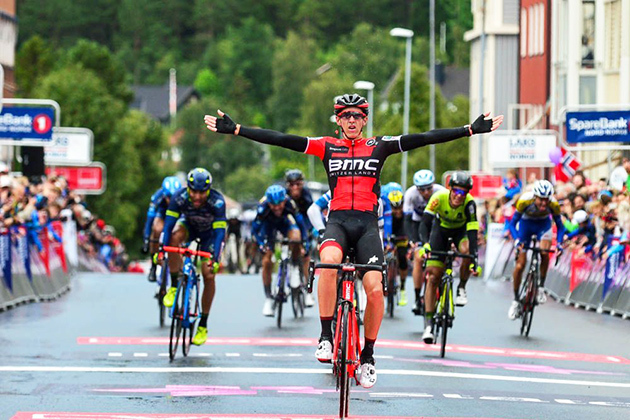 10 August, 2017, Narvik (NOR): Dylan Teuns secured his sixth win in three weeks today after powering away from the rest of the field to secure victory on the opening day of racing at the Arctic Tour of Norway. From the moment the flag dropped on stage 1, the pace of the peloton saw riders spread out across the road before an initial four rider breakaway went clear after 10km of racing. However, the speed of the bunch never wavered with riders drawn out in single file behind the quartet before they were ultimately caught with 136km of racing still to come. The attacks continued to fly off the front of the peloton with a group of 15 riders, including Danilo Wyss, extending an advantage of more than 30 seconds but, once again, they were pulled back as more riders tried their luck at the front of the race. Eventually, on the first of three categorized climbs, the Lavangseidet Summit, four riders were able to tip their advantage over the one-minute mark as the peloton finally sat up, allowing the action to settle down and the gap to grow further. The leaders' advantage peaked at over five minutes with 70km to go and the peloton quickly reacted, pulling them to within a comfortable two minutes heading into the final 50km before the final chase began, and the race was brought back together with 13km to go. More attacks started almost immediately and, as the peloton headed onto the 11km finishing circuit around Narvik, which included the final category one climb, two riders were holding onto a narrow advantage over the rest of the field. On the early slopes of the Skistua Summit, the steep gradient took its toll with the leading duo quickly pulled back before only a select group of 35 riders, including Teuns, was left in the main bunch heading onto the fast and technical run into the finish. Going under the flamme rouge, the road began to kick up once again, and Teuns seized the opportunity to continue his recent run of success by launching an explosive attack off the front of the group. With his intentions clear, Teuns made it look easy as he powered away from the rest of the field before punching the air with delight as he took the stage win and the first leader's jersey of the race. Congratulations, Dylan! Did you expect to win today's stage? "It was a bit of a surprise, but I knew that it wasn't going to come down to a big bunch sprint. I was here in 2015 when it was the final stage and Silvan Dillier won. This year it was only one lap and two years ago it three or four laps, so it was much harder, but from that, I knew that I had a chance and that it wouldn't come down to the sprint." Talk us through the final moments of the stage. "In the last 5km, I followed the good riders in front, but I didn't do any of the work, and I waited for the right moment on the final climb. I wasn't in the front at the beginning of the climb, I was maybe in a top ten position, but I moved to the front and then, I started my attack in the last few meters before the climb. I took the right corner and I saw I had a gap, so I just kept going until the finish line." "It's too early to think about the win as there are still three more days of racing to come, but I will work hard to defend the leader's jersey, and we will see what happens." Sports Director, Klaas Lodewyck: "The final was pretty hard today, and every rider had the opportunity to jump with the moves and they did a very good job. The group was not that big in the end, and it was good to have Dylan Teuns up there at the finish and take the win. He looked strong, and tomorrow we will work hard to defend the jersey but for now, we will enjoy this victory, and we will see what is possible over the course of the race." 4 PARDINI Olivier WB VERANCLASSIC s.t. 5 HAGEN Carl Fredrik JOKER ICOPAL s.t. 6 HOELGAARD Markus JOKER ICOPAL s.t. 7 KRISTOFF Alexander ﻿KATUSHA-ALPECIN s.t. 8 LIETAER ELIOT VLAANDEREN-BALOISE s.t. 10 GRELLIER Fabien DIRECT ENERGIE s.t. 12 PACHER Quentin DELKO-MARSEILLE PROVENCE s.t. 13 HOEM Börn Tore JOKER ICOPAL s.t. 14 VANGSTAD Andreas SPAREBANKEN SOR s.t. 16 GRIVKO Andrey ASTANA s.t. 19 HAGEN Krister TEAM COOP s.t. 20 WERKILUL Amanuel DIMENSION DATA s.t. 21 LUNKE Sindre Skjostad SUNWEB s.t. 22 BRESCHEL Matti ASTANA s.t. 23 DELFOSSE Sebastien WB VERANCLASSIC s.t. 24 WAEYTENS ZICO SUNWEB s.t. 26 PALUTA Michal CCC SPRANDI POLKOWICE s.t. 28 TRONDSEN Trond Hakon SPAREBANKEN SOR s.t. 30 HALVORSEN Kristoffer JOKER ICOPAL s.t. 32 DHAENE BRECHT WANTY-GROUPE GOBERT s.t. 34 DE NEGRI Pier Paolo NIPPO-VINI FANTINI s.t. 35 GERTS Floris Solco BMC s.t. 38 TRUSOV Nikolay GAZPROM-RUSVELO s.t. 39 CLAEYS Dimitri COFIDIS s.t. 40 CORBEL ERWANN FORTUNEO-OSCARO s.t. 41 DEGENDT Aimé VLAANDEREN-BALOISE s.t. 42 PLUCINSKI Leszek CCC SPRANDI POLKOWICE s.t. 45 BRUTT Pavel GAZPROM-RUSVELO s.t. 46 O'CONNOR Ben DIMENSION DATA s.t. 47 NAESEN Lawrence WB VERANCLASSIC s.t. 48 BOU Joan NIPPO-VINI FANTINI s.t. 49 LØVIK Åsmund Romstad TEAM FIXIT.NO s.t. 50 Welten Bram BMC s.t. 55 KRAGH ANDERSEN Asbjorn DELKO-MARSEILLE PROVENCE s.t. 56 HENTTALA Joonas NOVO NORDISK s.t. 57 DELTOMBE Kevin VLAANDEREN-BALOISE s.t. 58 ROHDE Leon SUNWEB s.t. 59 KANTER Max SUNWEB s.t. 60 DLAMINI Nicholas DIMENSION DATA s.t. 61 TILLER Rasmus Fossum JOKER ICOPAL s.t. 63 OFFREDO Yoann WANTY-GROUPE GOBERT s.t. 65 PONZI Simone CCC SPRANDI POLKOWICE s.t. 66 COUANON Jonathan DELKO-MARSEILLE PROVENCE s.t. 68 SALOMEIN Jarl VLAANDEREN-BALOISE s.t. 70 MASSON Christophe WB VERANCLASSIC s.t. 71 BLÅLID Marius TEAM FIXIT.NO s.t. 72 RYBALKIN Aleksey GAZPROM-RUSVELO s.t. 76 CARDIS Romain DIRECT ENERGIE s.t. 77 MANNINEN Matti TEAM FIXIT.NO s.t. 78 HUREL Tony DIRECT ENERGIE s.t. 80 AALRUST Håkon Lunder TEAM COOP s.t. 84 DEVRIENDT Tom WANTY-GROUPE GOBERT s.t. 86 EISEL Bernhard DIMENSION DATA s.t. 87 JANS Roy WB VERANCLASSIC s.t. 88 STENUIT Robin WANTY-GROUPE GOBERT s.t. 89 LUKKEDAL Oivind TEAM COOP s.t. 91 AUSTEVOLL Ole Andre TEAM COOP s.t. 92 HOLSTAD Ludvik Aspelund SPAREBANKEN SOR s.t. 93 TAARAMÄE Rein ﻿KATUSHA-ALPECIN s.t. 94 SKJOLD Mathias SPAREBANKEN SOR s.t. 95 NIYONSHUTI Adrien DIMENSION DATA s.t. 96 HOFSTETTER Hugo COFIDIS s.t. 97 DIAZ Daniel DELKO-MARSEILLE PROVENCE s.t. 98 MIHAYLOV Nikolay CCC SPRANDI POLKOWICE s.t. 99 NISHIMURA Hiroki NIPPO-VINI FANTINI s.t. 100 MEGIAS LEAL Javier NOVO NORDISK s.t. 101 VANBILSEN KENNETH COFIDIS s.t. 102 PETIT Adrien DIRECT ENERGIE s.t. 109 BRAMMEIER Matthew AQUA BLUE SPORT s.t. 111 DE KETELE Kenny VLAANDEREN-BALOISE s.t. 112 IRVINE Martyn AQUA BLUE SPORT s.t. 113 KIRSCH Alex WB VERANCLASSIC s.t. 114 BLIKRA Haavard TEAM COOP s.t. 115 VERSCHOOR Martijn NOVO NORDISK s.t. 117 BREIVOLD Jon Soeveras TEAM FIXIT.NO s.t. 118 BRULAND Eirik SPAREBANKEN SOR s.t. 119 MOLLY Kenny FORTUNEO-OSCARO s.t. 120 RESTREPO Jhonatan ﻿KATUSHA-ALPECIN s.t. 121 HIVERT Jonathan DIRECT ENERGIE s.t. 6 HAGEN Carl Fredrik JOKER ICOPAL s.t. 79 DE BACKER Bert SUNWEB s.t. 85 LUKKEDAL Oivind TEAM COOP s.t. 87 DEVRIENDT Tom WANTY-GROUPE GOBERT s.t. 89 JANS Roy WB VERANCLASSIC s.t. 90 STENUIT Robin WANTY-GROUPE GOBERT s.t. 91 LAUK Karl Patrick ASTANA s.t. 92 AUSTEVOLL Ole Andre TEAM COOP s.t. 93 HOLSTAD Ludvik Aspelund SPAREBANKEN SOR s.t. 94 TAARAMÄE Rein ﻿KATUSHA-ALPECIN s.t. 95 SKJOLD Mathias SPAREBANKEN SOR s.t. 96 NIYONSHUTI Adrien DIMENSION DATA s.t. 97 HOFSTETTER Hugo COFIDIS s.t.